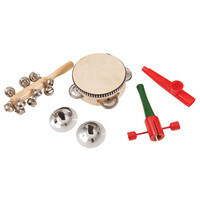 The Performance Percussion PK10 is a percussion set combining jingles and wood hand percussion. It contains a tambourine sleighbell stick clapper finger cymbals and kazoo. It is ideal for schools and music groups.